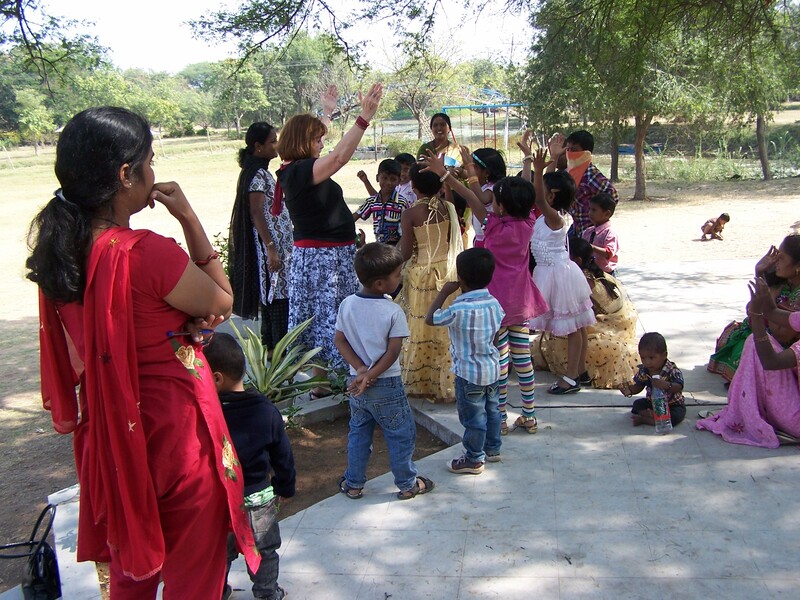 Six years ago when we first began coming to India together, there were few young children in the families of our pastors. The reason for this – few of our pastors had been married long, and a number were single. One exception was Pastor D and his wife E. They had three daughters who were between the ages of 7 and 11. We adopted them, not literally of course, as our granddaughters. The word for grandfather here is “tata,” and the word for grandmother is “agee.” I well remember the visit when the middle girl, who speaks 5 languages, called me her tata and looked so forlorn as we drove from the conference site for the last time. Those three young women were not present this time. They’ve spent this year in a good Catholic school a couple hundred miles or so from their home. We greatly missed them. But there was a whole host of other children to take their places. Five years ago one of my former students was wed. 3 years ago he introduced us to the daughter that had been born to them. They named her “Luana.” This year he came to the conference on its second day. His wife and daughter did not accompany him, but he told me that God had given him son. He reminded me, Two years ago when you saw Luana, you said Frank is coming. He looked into my eyes. Frank has come, he said. But, he hastened to add about his baby boy, He is not like you. What he wanted me to know was that my namesake looks like he’s from India. Not like a foreigner, he said. I laughed. One of the newest little ones cried whenever either Luana or I looked at her. Screamed, in fact, afraid of the strange looking foreigners. When I first discovered this, I remarked to our translator, I’m too white. He grinned. Like a ghost, he said. We both laughed heartily. His name is Franklin. My good friend from Crusade jokingly called him Frank Junior. The little ones hung around us. They even came to sit on my lap. 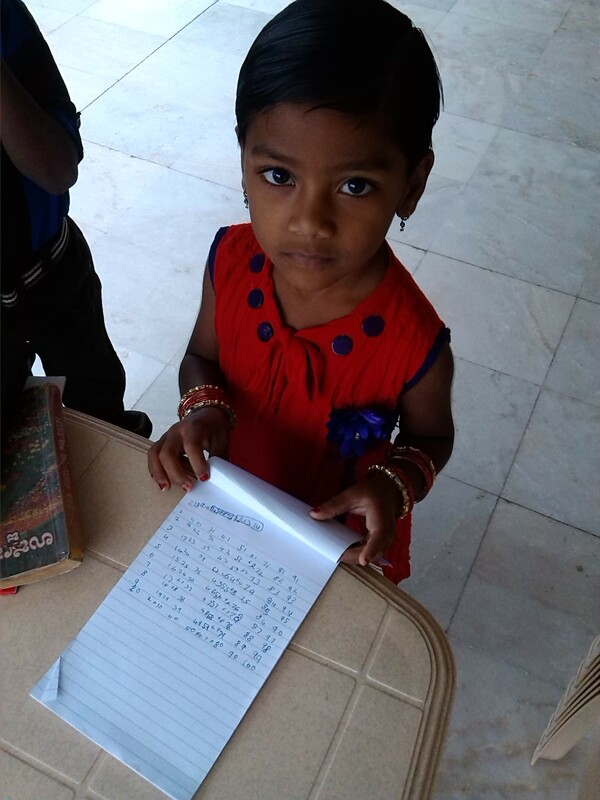 Little Kruppa, a kindergartner, seized my pen and began to write her ABCs (in both her native language and English) as well as her numbers from 1 to 100 on her tablet. Did that more than a few times, always showing me what she’d accomplished. Cries of “tata, tata” followed me wherever I went. Hmm, I mused, they used to call me “uncle,” but I’ve now graduated to “grandfather.” I like that. Agee Luana doesn’t mind her new title either. We brought a whole suitcase of inexpensive little balls that light up when they’re bounced. One for each grandchild, with the name written on the ball. We planned to give these out after the last session, so Agee brought the large bag down to the meeting place after I’d begun speaking. Two little boys saw the bag and raced over to where the other children were playing. Soon a host of little faces were pressed against the screen behind Agee, staring at the bag. It was better than Christmas when we held up each ball and announced its new owner’s name. Much better. We may look like ghosts to them :o), but we sure do have a lot of beautiful brown grandkids over here! Tata Frank and Agee Luana will be leaving India today. But Luana and Frank are also staying there as well! We were plenty tired last night after our 3 a.m. wake-up. Supper was served about 8 p.m. IST (see previous blog), and we retired to our quarters shortly after eating. When we found the Retreat Center on Saturday the manager had given us a tour of the facility, showing us both the meeting places, the restaurant, and what he called cottages – the accommodations for families and singles that would be coming. The first of the cottages is the one we actually were given yesterday upon arrival. We were pleased to see that in reality it was a one-bedroom apartment that contained a bath. A king bed in the bedroom. Air conditioner on the wall. This’ll do, we said. This will be fine. The accommodations would be more than fine for our brothers and sisters who live in spaces much smaller and less well equipped than this. One of the things I’d specified was that instead of us returning to our hotel each evening, we would stay on the site of the Conference if there were a room with air conditioning for us. Well, the air conditioner doesn’t work. Not that we needed it last night, for it was cool enough. But, it wouldn’t have mattered if we had. We sat in the small parlor for a while debriefing, but our weariness conquered us, and I headed for the shower. There was no shower. There was a showerhead with hot and cold water taps. But there was no connection between that head and those knobs. Only the ubiquitous bucket and pitcher one sees in the restrooms of this country. Two taps with a spout. It was hot water on demand – push a switch to activate the element heating the water in the tank hanging on the wall, wait a few minutes and go for it. I took a pour last night, not a shower. Same results, just a different method. The bed had no bedding on it. A reasonable, though thin mattress, but only some sort of thin blanket on it. There were two pillows. Rather, there were two 8”x16”x3” apparently wooden blocks covered with material. At least they seemed that hard. Fortunately Luana’d brought two travel pillows with us. While we were contemplating this situation, a young man appeared at the door with two blankets. Upon close inspection we weren’t at all sure we wanted to use them, and Luana didn’t. She spread two of the shawls we’d received on top of the “bedspread” and covered herself with a third that Jeff Petersen donated to us before he departed for a brief night’s sleep in his own hectic schedule. I figured I’d do without a covering, but abandoned that idea after maybe an hour. Slept pretty well too. Woke up about 5:30. Luana’s still out. And, a few minutes ago as I sat here typing this blog, I caught a movement three feet to my right. A small brown toad startled me by hopping out from under the broken down love seat. Couldn’t believe my eyes. Ushered him (or her) out the door and over the side of the terrace. There is a marble tile floor and the remnants of a small Indian rug, but it’s not the Taj. It’s okay, and it will do. We are 12½ time zones removed from Haxtun, CO – our present temporary home. 11½ from Harvard, NE – our present temporary home as well. One half of a time zone? How and why does that work? The Subcontinent’s desire was to be united in one zone. Not sure when all this took place, but the nation occupies 2½ time zones. The whole nation, one third the landmass of the USA, is on the same time. Do you want to know what that zone is? Indian Standard Time. Do you want to know what Indian Standard Time is? Let me see if I can explain. This morning Luana and awoke about the same time, and it was early…in any time zone. About 3 o’clock to be exact. No going back to sleep either. No, there weren’t any dogs making noise outside our hotel like last year. In fact, the only sounds we ever hear from the outside are those of children playing down near the potter’s business, or that of the Muslim call to prayer. We heard that sound at 5. I used the time to blog a bit, she to read. After that, while it was still pitch dark outside, we readied ourselves for the day and packed up. This was moving day. We’d be taking our stuff out to the facility where we’d meet our friends in ministry. We’d be staying there for the next two nights. Breakfast followed, and soon enough we were in the cab and on our way. The first meeting was to begin at 9 o’clock, and we left plenty early to make it on time. 7:30. The trip would take an hour, we were told. Wonder of wonders – our taxi driver knew pretty much where the place was, and we arrived on time. On the way, on the way, said the manager of the facility. 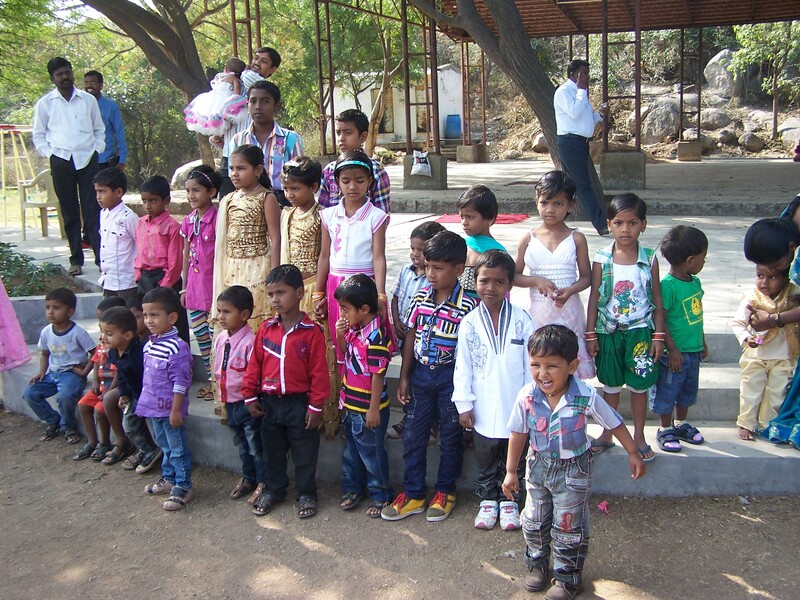 The pastors and families had taken a 6-hour train ride from a location within 3 hours of their respective places of ministry, and they were now on a bus from the train station to the Divya Retreat Center. We were standing in the drive of this rocky, hilly place when the bus pulled in. What joy we experienced as they piled out. At least one baby born since last year. Children all growing and beautiful. 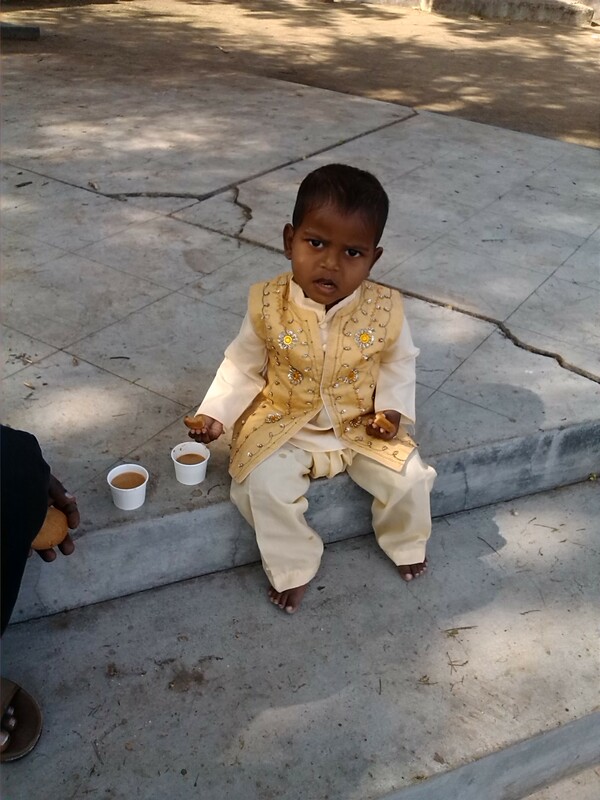 Little Prajwal all healed from the surgery on his urinary tract. A couple of bachelor pastors reporting they are to be wed in April or May this year. Joy! And, almost 40 minutes late. In addition they still had to find their lodgings. I resisted the urge to make things happen, to hurry things along so the schedule might mean something. Never mind that it was their schedule, and that they’d set up this conference. So, I said to the facility director, Will we be going down to the meeting place? Oh, he said, They will go to their rooms to freshen up. Then they will eat breakfast. I looked at my watch. Time was ticking away. But it didn’t matter. The folks trailed into the restaurant (sort of a loosely applied term) to eat. Luana and I had tea, and then I wandered down to the large gazebo-type building where the meeting would be held. Only two others were there, both members of the Board of Directors. They were fiddling around with a pesky public address system that we eventually abandoned anyway. Slowly folks ambled to the meeting place. Finally, about two hours and fifteen minutes past time, the worship team from one of the clusters, five pastors, led vigorous a cappella singing. The traditional gifts of shawls and leis were granted to both Western and Eastern dignitaries (including us and Jeff Petersen who almost literally dropped in on his way from Nepal to Europe), and I addressed the crowd through a deft translator. I was speaking in the time slot originally allotted to the main attraction, a man from their state who spoke their language – no translator needed. But that man had not yet arrived! Are you beginning to understand Indian Standard Time? Well, the featured speaker showed up, was introduced, and commenced to give at least an hour-long sermon followed by one of the longest public prayers I have ever heard. Of course, any prayer given in a language with which the listener is unfamiliar might seem long. But that one was long, and I think it would have been so in plain English. At any rate, the morning session that was supposed to begin at 9 and end at 1 actually ended only ½ hour past time. Indian Standard Time, that is. A herd of elephants from the forests along the Karnataka border have been creating panic in Baireddipalle mandal for the last two days. Forest officials said the herd was a new batch and was not connected to the 41 member herd now on prowl in Kuppam and Gududpalle mandals. The herd created panic among the farmers when a dozen elephants barged into a hut on the fields at Kadathatla village on Friday night. The inmates escaped and climbed a tree nearby. Women in the house and surrounding huts ran helter-skelter and saved the lives, hid themselves in the fields. in pitch darkness. However, the villagers deplored that the forest officials did not take the incident seriously.The villagers said that the elephants were moving close to the human habitations by Saturday evening. “’Arise and go down to the potter’s house, and there I will announce My words to you.’ Then I went down to the potter’s house, and there he was, making something on the wheel.” These words are found in Jeremiah’s prophecy, chapter 18, verses 2 and 3. 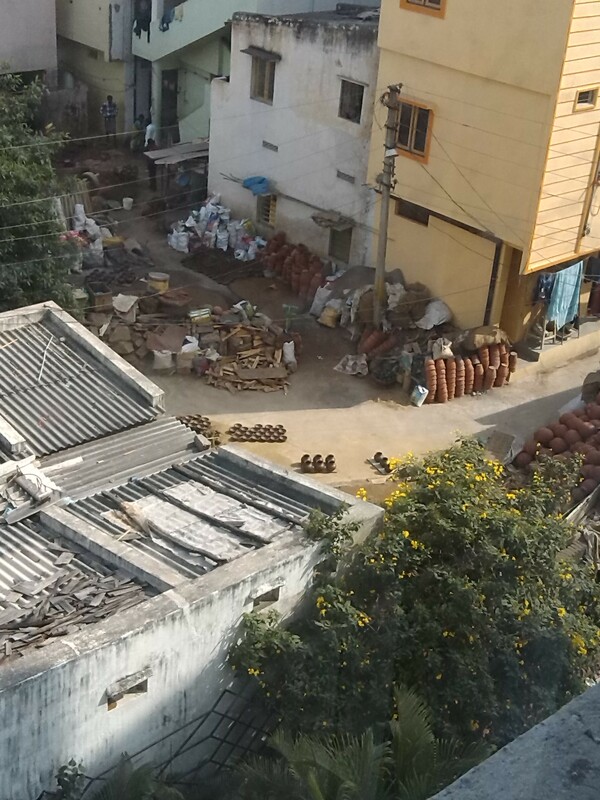 For two days we looked down from our hotel window with regularity at a pottery-making business. We’ve got to go down there, we said. But to get there from here was quite another story. After we returned from worship today, and after we’d eaten our lunch and given it time to settle, we took a stroll through the neighborhood. Somehow the word “neighborhood” seems a little odd in this city of 8 million, but as we would find out, it really does apply. We wandered down around the corner and headed up the street where we knew there’d be some vendors selling those short and sweet bananas we like so much. A beggar lady quickly came across the road to begin pestering us. She was as insistent in her own way as the salesmen in the handicraft store were yesterday. Both parties desperately wanted something from us. I bought some bananas and gave alms to the beggar. We wandered on down the street, taking pictures of whatever caught our fancy – everything from men at work in a ditch making repairs to the water system to a lone dog sitting on the median watching the traffic go by to scavenging waifs with large bags of whatever on their backs. When we retraced our steps, young men in auto rickshaws encouraged us to snap their photos. The beggar lady inserted herself into the frame, laughing with the boys as she did so. We escaped from the mendicant into the secured drive leading to the hotel. Our intent was to find our way to the pottery business, but we needed the aid of one of the hotel doormen to do so. He led us through an obscure path littered with trash to some narrow streets that were more like walkways between buildings. One-room dwellings lined the walkways. After three left turns, we found ourselves standing in the midst of the scene upon which we’d looked the last couple of days. Here was where the pile of lumps of raw clay had lain. There was a sheet of the material setting up to a workable consistency. 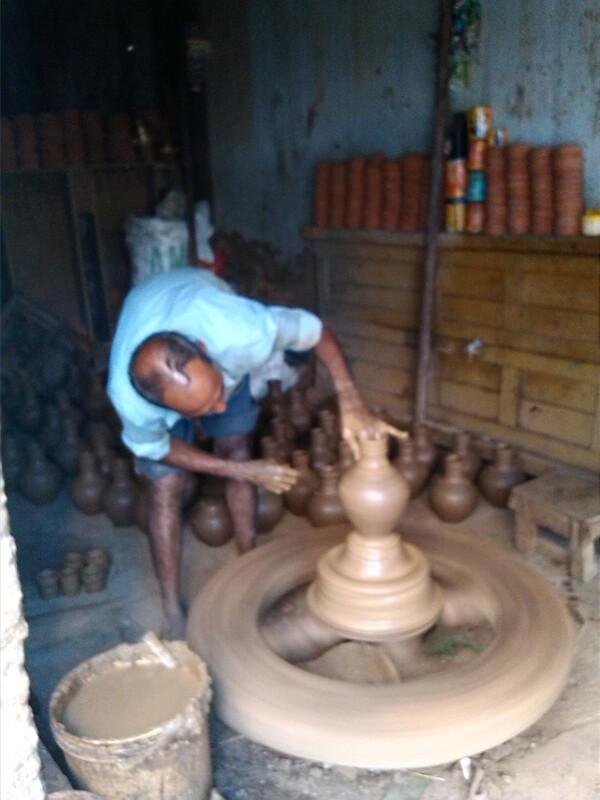 And here was the potter himself. 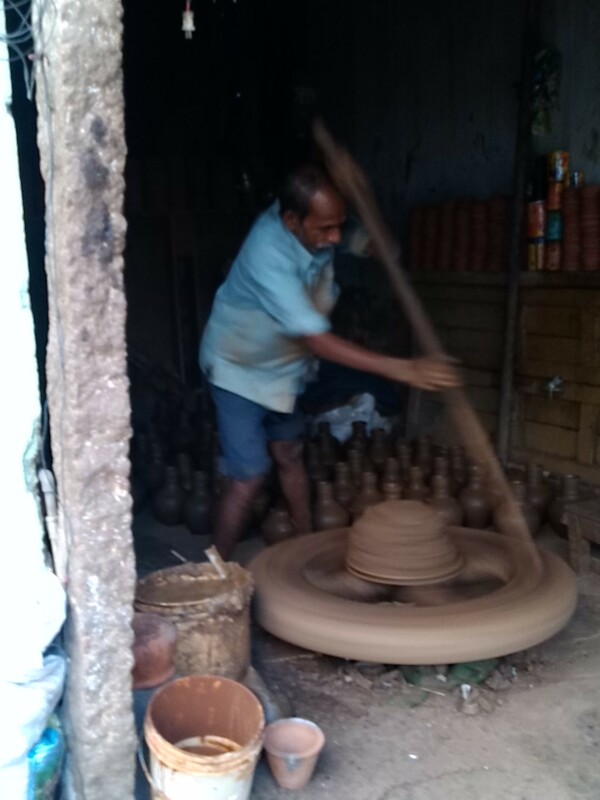 He was about to make something on the wheel. As we watched this fascinating process, people began to gather around us. In this neighborhood they weren’t used to seeing people of our color and clothing. A girl named Sneha spoke English well and translated for us. We took pictures of several. Two young women, one of whom did not speak my language, taught me how to use the Bluetooth sharing feature on my phone to send to them their photo. We met numbers of children. And, we promised to return next Thursday to purchase something the craftsman with the wheel had made. We went down to the potter’s house, or, shall we say, to his neighborhood; and the man was making something on his wheel. No, the Lord didn’t announce his word to us; but we were reminded anew of the desperate plight of so many millions of folks stumbling around in the intense spiritual darkness of this land as well as of their openness and friendliness. How does one go about looking for a good Bible-preaching church in a city of 8 million people? Actually, in a city of 8 million people who may or may not speak understandable English? And no, I am not talking about New York City, though the quest there might be equally as daunting. I’m talking about Hyderabad, Andhra Pradesh, India, the city in which we’ve been located since Friday morning. Saturday seemed like a good day to find the location of the Family Conference we will be attending with our brothers and sisters from the neighboring state. A new spot secured by the Board of Directors of the BFC there. We gave the address to the cab driver furnished by the hotel. He called the number of the organization to which the facility belongs, I talked to someone on the phone, and we took off. We took off to wander through the meandering and crowded streets of this metropolis for nearly an hour and forty-five minutes, stopping periodically to ask for help. At least our driver had the sense to do that. We eventually found ourselves quite out of the city, and just when we were about to despair, we spotted a small sign on which were both the name of the retreat center and an arrow pointing down a dusty lane. The facility proved to be quite nice, and it will provide our pastors and their families a great venue for enjoying the outdoors as well as each other for the three days we will be together. On the return trip, after our driver insisted on taking us to a couple of shops that were intent on emptying our not too thick wallets, we asked him about taking us to church the next morning. This morning, in fact. At the hotel reception desk we learned that there is a CSI (Church of South India) somewhere in the vicinity. Our driver said he knew the church. But that driver didn’t show up this morning. Another guy did, and yes, he said he knew where that church was. He found the church he’d been thinking of, but it happened to be St. Mary’s Catholic Church. That’s not it, I said. We drove a bit further. He tried to use Google Maps on his phone. Internet was too slow. We rounded a curve and there was a large Methodist Church building. No CSI facility in site. I thought this might be ok, but by that time we’d passed the Methodists. Let’s go back there, I instructed. Of course there aren’t any square corners in this place, no such things as blocks as we know them. But as we made some sort of a circuit to go back to the Methodists we encountered a sign for Centenary Baptist Church. We had no idea if we’d find the Methodist building again. This’ll do, Luana said. So we disembarked to discover that the service would be over about 12 o’clock – two and a half hours hence. Our cabby said he’d be back at that time. People on the outside of the building were drinking tea – the English kind. No special coffees here. We met a kind lady who identified herself as the pastor’s wife. We met the pastor who, when he heard we were from the USA and that I was a pastor, asked if I were going to preach. No, I said. And we went inside to find a seat. That was not hard to do, because the huge worship center was practically empty. 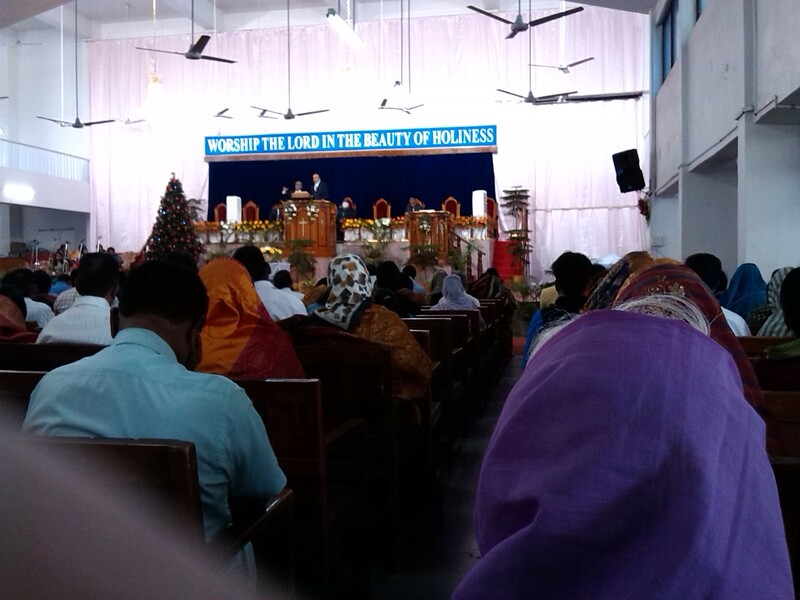 The service began with a praise song. Prayers were offered. Announcements were made at length. And people continued to wander in. They continued to wander in for the next hour until the whole church was full. I calculated there were in the neighborhood of 500 folks present. The speaker for the day, it so happened, was a Dr Mohannan Unni from Boston. He is a former Hindu, born in the southernmost state of Kerala, India. Dr Unni became a disciple of Jesus after graduation from Boston University with a degree in engineering. His charge to us was in English, and it was about making disciples. His text was from Matthew chapters 5 and 28. A translator took it to the folks in Hindi. The rest of the service was in Hindi. The language barrier was not significant. We were blessed by the singing. We were blessed by the emphasis on prayer. We were blessed by smiles and greetings from a number of folks, both small and great. We were blessed by the preaching of the Word. We were blessed to have been directed by the Lord to a vibrant part of his Body in this city, the Pearl Capital of India. We were blessed on this Lord’s Day to be with God’s people. We arrived at our hotel this Friday morning, January 10, at about 6:30 after flying through the night from London. Those 8 hours contained no sleep for Luana, only about an hour and a half for me. An hour and a half or none at all for the previous 36. We fell into bed and slept for about 5 hours, awaking at noon Friday. We’d thought we might visit some local attractions, but after heating up our taste buds at the hotel lunch buffet, we didn’t go out of our door again. After observing a local pottery making operation from the window of our room, we flopped onto the bed again and wound up unconscious for another 3 hours. And this time there are no dogs barking, howling, fighting, or doing much of anything, for that matter, in the immediate vicinity of our lodgings! Denver International is undergoing construction…again, I guess. Something about the one end of the terminal going to mirror the other. Something like that. Whatever it was, it affected the shuttle service from the long term parking lot. Dropped us off in the twilight of a parking garage. We followed the temporary signs to some elevators in the basement of the terminal and eventually found our way to the 6th floor check-in area. British Airways was way down at the end of the line, and a long line was beginning to form there. We met a couple that have been serving for 27 years in Uganda heading up an orphanage. They had lots of stuff and were the reason for the long line behind. There were some slight problems with our tickets. The second leg of our journey, the one from London to Hyderabad, was not in the system. That in addition to the fact that our request for adjoining seats had not been honored. But the kind lady behind the counter worked it all out, even giving us seats together for both flights. The 777 was configured differently than any we’d flown to this point – three sets of three seats across in the economy class. Our seatmate was a lady from Edinburgh, Scotland. Jeanette had married an American serviceman and had lived the last 20-some years in Woodland, Colorado. A brother-in-law in Scotland is dying of cancer. Possibly two weeks to live. Hence her trip home. I think she was about 70 years old. Before the 8 hour flight ended, Luana took the opportunity to explain the hope that is to be found in trusting Jesus, even in the face of the death of a loved one. I made some offhand remark about Brits, and she told us she was a Brit. Born and raised in a portion of the British Isles. Just not English. Who knew? The British Airways crew was very congenial, very helpful, and knew how to laugh. My ability to laugh was slightly tempered by the following facts: the video screen for my seat didn’t work properly so that I couldn’t watch Planes, and the young lady in the seat ahead of mine reclined the thing immediately, putting its back about 12 inches from my face. It promised to be a long 8 hours. When I did get the screen to work, it only did so for about half of the movie. However, realizing that this didn’t really constitute suffering for Jesus, I managed to shrug it off. We are now in Heathrow Airport, London, stomachs full from our English breakfast, and waiting to board another plane manned by Brits. They and we are a decided minority on this aircraft as we head for the land that is two thirds the way to down under. “It’s a dangerous business, Frodo, going out your door. You step onto the road, and if you don’t keep your feet, there’s no knowing where you might be swept off to.” So said Bilbo Baggins of Bag End in Middle Earth in the Third Age (Lord of the Rings – Fellowship of the Ring, J.R. Tolkien). Well, he was right, I guess. The world we live in is a dangerous place, perhaps more now than ever. Natural disasters can sweep a person off his feet, or out of the air, with little or no warning. The same kind of evil folk lurk in the dark places today as did in Tolkien’s fictional world. And, though there is no wicked Lord Sauron sitting as the Evil Eye atop Mordor, there is a very real and evil devil who’s described as a roaring lion in the Scriptures that desires to devour and as one who seeks to work us woe by a well-known former monk of the Late Middle Ages of our real world. I’m thinking these things this morning here in Haxtun, Colorado. It’s a long way outside the door of 345 North Edmund to the Divya Retreat Center near Hyderabad where we’ll meet our brothers and sisters for a time of encouragement and challenge. A long, long way. How far is it? The way we’re going, via London, it’s 9,400 miles, give or take a few. It’s 2/3 of the way to the land down under. Plenty of time and distance from home for a lot to happen, perhaps some of it not so good. But, when we go outside our door, it won’t be just the two of us. And, no, we don’t have a gardener like Mr Gamgee going along to watch out for us. The One who said, “I am with you always, even to the end of the world” goes with us. Jesus is greater that any dangerous business anywhere. And for that we are most grateful. Back in July Luana and I had ridden my old Yamaha to the Kansas City Mo area to visit the Nate VanCampen family there. Unfortunately enough, that V-twin developed a bad knock in the bottom end, necessitating the use of Nate’s Honda 800 Shadow for the return trip. Two senior citizens on a cruiser-style bike for nearly 300 miles, 60 of those through rain! About five weeks later we headed back down the road toward Nate’s with his motorcycle in the back of my pickup truck. It was an August day that held the promise of high temps. We packed a lunch. After an uneventful couple of hours or so we were nearing the halfway mark in the journey along US Highway 36 in northern Kansas when we found a rest stop complete with picnic tables. Here is where the adventure of these two senior citizens really began. We consumed the sandwiches and beverages in the shade of the shelter and walked up the hill to the truck. “Funny,” I thought as I pulled on the driver’s side handle, “I don’t remember locking the doors.” The look on my face that was a cross between disbelief, consternation, and dismay was clearly visible to my wife through the windows of both doors. I pointed to the interior of the vehicle at not one, but two sets of keys lying inside. How in the world had this happened? Surely it was her hand that had, however inadvertently, hit the door lock switch as she exited the pickup. That was my first thought. I’m sure she was thinking the opposite as we stared disconsolately at the items that were both totally inaccessible and totally necessary. What to do? No other folks in the rest stop area. Only a large truck with its motor idling. Driver must have been asleep in the back. A quick trip up the road about a quarter of a mile to the nearest farm house produced not only a kid home sick from school but also a stiff piece of number 9 wire and a pair of pliers with which to fashion it into a burglar’s implement. That was a worthless exercise, because there was no way I could force the top of the door open far enough to admit the crude tool, let alone manipulate it. Another truck pulled into the rest area, its driver desirous of lending aid even to the point of giving me a lift into the nearest town on his route east. We left my patient wife sitting under the picnic shelter, keeping watch on a vehicle that was probably theft-proof anyway. But, there was only room for one passenger. Nice guy, that trucker. Delivered me right across the road from the first quick stop we came to. “This an older gentleman.” Was she really talking about me? ” This man left his senior wife out there in the heat,” replied my advocate behind the counter. I know I was amused at my own wit, but I can’t remember if she laughed. I was, however, appreciative of her concern. And her concern was rewarded when a deputy sheriff pulled up and came in. We walked out to his car, and from his side of the vehicle he said he’d clear off the passenger seat. “I can ride in the back,” I said as I viewed the pile of papers and notebooks up front. “No you can’t,” he replied in a humorless tone as I tried vainly to peer through the darkly tinted window into the rear seat area and reached for the door handle. I obediently climbed into the front. As we pulled on to the west bound lane of the highway, my eyes fell on what appeared to be animal hairs on the seat and on the console that separated me from the officer. At the same time my nose picked up the distinct scent of dog. “Humph,” I thought, “he must haul a dog around in here.” And as I slowly turned my head to glance into the backseat I found myself staring through a wire mesh into the dark eyes of a large German shepherd. This elderly gentleman had altogether missed the plain lettering on the side of the car, lettering that clearly spelled out the fact that this was a K9 vehicle. No wonder I couldn’t ride in the back. “It’s called “acceptance,” he said in a near monotone, eyes fixed on the road, face a mask. The dog panted somewhere close to the back of my head, and I wondered what his master had encountered in his relatively young marriage. We rode on in silence until we turned off the highway into the rest area. Luana arose from the picnic bench and started across the grass toward us. “There’s my senior wife,” I said; and the deputy laughed out loud as he exited the K9 Unit. We made it the rest of the way to our kids’ house without incident; and we have chuckled many times since about how others perceive us at this stage of our lives.